Our hotel is situated in the historical old town of Lucerne, on the river Reuss with a view to the Pilatus and Titlis mountains. The Tourist Hotel is a great place for individuals, families and groups. We offer a variety of rooms to satisfy diverse needs. We have 100 beds on 4 floors serviced by an elevator. In particular, we offer rooms for handicapped persons using a wheelchair. Single and double rooms, 3 and 4 bedded rooms, family rooms and a suite for 6 people. Depending on price, you can choose between private and shared bathroom facilities. Most rooms - some with a balcony - have a great view to the river and mountains. Depending on price, you can choose between private or shared bathroom facilities. most of the rooms have a balcony with a great view into the mountains and on the river. 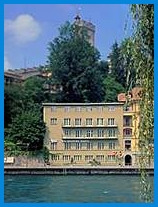 Our hotel is situated in the old town of Lucerne only a few minutes from the station, the lake and the shopping area. Directly at the riverside.